For decades, the predominant model for deploying voice technology was on premises. However, over the past five years, the opinion of cloud-based voice services, such as Office 365, has changed dramatically. Just five years ago, the majority of businesses either felt that cloud unified communication was not viable or were taking a wait and see approach. Today the majority of respondents are planning a minor or major cloud UC purchase. For Microsoft customers, Skype for Business in Office 365 provides an excellent alternative to a traditional premises-based deployment. 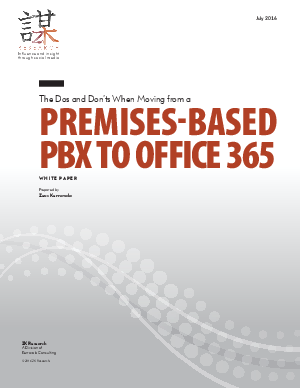 Download the paper for Five Do’s and Don’ts When Moving from a Premises-Based PBX to Office 365.